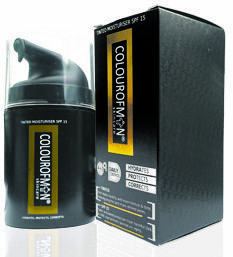 Fragrance free and suitable for all skin types, Colourofman Tinted Moisturiser is the perfect multi-functional moisturiser. The sheer, lightweight, paraben-free, mineral-infused formulation hydrates skin while subtly concealing irregularities and controlling shine. The conceal-blend moisturiser by Colourofmen skincare, is one of the most exciting skincare grooming product to come to the market this year, helping men look their best without compromising their masculinity. It's easy and practical to use and leaving you confident and looking good. 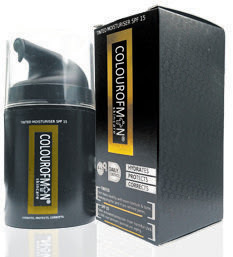 Colourofman comes in four tinted shades that have been matched to blend seamlessly with most skin tones to give men a natural healthy, no makeup/even look. The conceal-blend moisturiser was formulated to simplify what would have been an over-kill to the grooming routine. Whilst the moisturiser concealer covers redness and blemishes on the face and has matte baree ordless 15SPF serum moisturiser that will work with your skin all day. This multi-functional moisturiser instantly perfects, brightens, control shine and hydrates with SPF 15 protection. It's the ideal product for guys who want a streamlined regime. helps correct flaws & uneven skin tone to perfect overall complexion. This multi-tasking formula also helps brighten and provide a healthy glow to the skin while protecting the skin from UVA/UVB rays with SPF15. It provides skin hydration and also helps smooth and improve the look of fine lines and wrinkles.